"ամեն անգամ, երբ մենք հետադարձ հայացք գցենք այս պահին, երբ մենք ստորագրեցինք Սինգապուրի անջատումը Մալայզիայից, այդ կլինի ցավի պահ։ Իմ համար դա ցավի պահ է, որովհետև իմ ողջ կյանքում ․․․ դուք տեսնում եք, իմ ողջ չափահաս կյանքի ընթացքում ․․․ ես հավատում էի այս երկու տարածքների միավորմանը։ Գիտեք, այս ժողովուրդները կապված են աշխարհագրությամբ, տնտեսությամբ և բարեկամական կապերով ․․․"
"Մի անհանգստացեք Սինգապուրի մասին։ Իմ գործընկերները և ես առողջ դատողությամբ և ռացիոնալ մարդիկ ենք, նույնիսկ տառապանքի պահերին։ Մենք ծանր ու թեթև կանենք բոլոր հնարավոր հետևանքները նախքան քաղաքական խաղատախտակի վրա քայլ կատարելը ․․․ "
"...քանի որ ես այն շատ չէի օգտագործում, այն դառնում էր մոռացված և առկա է լեզվի կորուստ։ Այնուհետև և ստիպված եմ վերակենդանացնել այն։ Դա սարսափելի խնդիր է, որովհետև չափահաս տարիքում սովորելը նույն արմատները չի գցում քո հիշողության մեջ։"
"Մնացած աշխարհում մենք պետք է գտնենք մեր նիշան, փոքր անկյուններ, որտեղ չնայած մեր մեր փոքրաթիվ լինելուն, մենք կարող ենք աշխարհին օգտակար դեր ստանձնել։ Դրան հասնելու համար, վերևում մենք պետք է ունենանք որոշում կայացնողներ, ովքեր հեռատես են, լավ ուղեղներ, ովքեր բաց են գաղափարների համար, ովքեր կարող են օգտվել հնարավորություններից, ինչպես մենք դա արեցինք․․․ Իմ աշխատանքը իրականում իմ հետևորդներին գտնելն էր։ Ես գտա նրանց, նրանք կան; նրանց աշխատանքն իրենց հաջորդներին գտնելն է։ Այսպիսով պետք է լինի տաղանդավոր, նվիրված, ազնիվ, ունակ մարդկանց շարունակական նորացում, ովքեր կգործեն ոչ թե իրենց շահերից ելնելով, այլ իրենց ժողովրդի և իրենց երկրի համար։ Եթե նրանք կարող են դա անել, նրանք կփոխանցեն ևս մի սերընդի և այդպես շարունակ։ Այն պահին երբ դա խախտվի, այն կփլուզվի։"
"Ես չեմ ասում, թե այն բոլորը ինչ ես արել եմ ճիշտ էր, բայց ամեն ինչ ես արել եմ բարի նպատակների համար էր։ Ես հարկադրված էի անդուր բաներ անել, տղաներին առանց դատի պատժել։"
1959 - 1990 թվականներին, Լին որպես Սինգապուրի վարչապետ, նախագահաել է Սինգապուրի բազմաթիվ հաջողություններում։ Սինգապուրի մեկ անձին ընկնող Համախառն ազգային արդյունքը աճել էր $1, 240 (1959) մինչև $18, 437 (1990). Սինգապուրում Գործազրկության ցուցանիշը 13.5% (1959) իջել էր 1.7% in (1990). Արտաքին առևտուրը $7.3 բիլիոնից (1959) աճել էր $205 բիլիոն (1990). Այլ բնագավառներում, կյանքի տևողությունը աճել էր 65 տարուց (1960) մինչև 74 տարի (1990)։ Ժողովրդագրությունը՝ Սինգապուրի բնակչությունը 1.6 միլիոնից (1959) աճել էր 3 միլիոն (1990)։ Պետական բնակարանների թիվը 22, 975-ից (1959) աճել էր 667, 575 (1990)։ Գրագիտության մակարդակը Սինգապուրում 52%-ից (1957) բարձրացել էր 90% (1990)։ Զբոսաշրջությունը 0.1 միլիոնից (1960) աճել էր 5.3 միլիոն (1990). ↑ 1,0 1,1 1,2 1,3 1,4 Lee Kuan Yew, Founding Father and First Premier of Singapore, Dies at 91 — The New York Times, 2015. ↑ 2,0 2,1 2,2 2,3 2,4 Ли Куан Ю // Большая советская энциклопедия: [в 30 т.] / под ред. А. М. Прохоров — 3-е изд. — М.: Советская энциклопедия, 1969. ↑ 4,00 4,01 4,02 4,03 4,04 4,05 4,06 4,07 4,08 4,09 4,10 (not translated to en-gb) Lee Kuan Yew obituary — The Guardian, 2015. ↑ 5,0 5,1 5,2 5,3 5,4 新加坡建国总理李光耀逝世 — 联合早报, 2015. ↑ 7,0 7,1 7,2 Fernandez W. Singapore's founding father Mr Lee Kuan Yew dies aged 91 at 3.18am on Monday — The Straits Times, 2015. ↑ Kristof N. PREMIER'S SON GETS POST IN SINGAPORE — The New York Times, 1986. ↑ Reporter: Peter Day (հուլիսի 5, 2000). «Singapore's elder statesman». From Our Own Correspondent. BBC World Service. ↑ «Lagacy of Lee Kuan Yew, 1923-2015». Meet the Press. մարտի 23, 2015. CNBC. CNBC Asia. ↑ Lennox A. Mills, Southeast Asia: Illusion and Reality in Politics and Economics, University of Minnesota Press, p. 60. ↑ Arthur Cotterell, A History of South East Asia, Marshall Cavendish International Asia Pte Ltd, 15 July 2014, p. 345. ↑ Alex Josey, Lee Kuan Yew: The Crucial Years, Marshall Cavendish International Asia Pte Ltd, 2013, p. 608. ↑ For one journalist's personal view of these events, see Pillai, M.G.G., Did Lee Kuan Yew want Singapore ejected from Malaysia? Wayback Machine-ի միջոցով: (archived 13 Հոկտեմբեր 2007), Malaysia Today, 1 November 2005. ↑ Robert W. Hefner, The Politics of Multiculturalism: Pluralism and Citizenship in Malaysia, Singapore, and Indonesia, University of Hawaii Press, 1 January 2001, p. 4. ↑ See, for example, Koh Buck Song (1 August 1996), "The Route To Success — Keeping Singapore Green And Efficient". The Straits Times (Singapore). 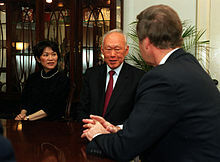 ↑ Lee Kuan Yew (21 September 1998). "The Singapore Story". Time Asia (Hong Kong). ↑ Chan Eng Cheng (4 February 1983). An Agnostic speaks. The Straits Times (Singapore). ↑ 108,0 108,1 Transcript of Minister Mentor Lee Kuan Yew's interview with Seth Mydans ofNew York Times & IHT on 1 September 2010., Prime Minister's Office of Singapore. Retrieved 31 January 2014. ↑ "Lee Kuan Yew on death: I want mine quickly, painlessly". The Star (Kuala Lumpur), 6 August 2013. ↑ TRANSCRIPT OF MINISTER MENTOR LEE KUAN YEW'S INTERVIEW WITH MARK JACOBSON FROM NATIONAL GEOGRAPHIC ON 6 JULY 2009 (FOR NATIONAL GEOGRAPHIC MAGAZINE JAN 2010 EDITION), SGPressCentre; retrieved 1 February 2014. ↑ Lee Kuan Yew bids farewell to brother, AsiaOne.com, 30 June 2012; retrieved 1 February 2014. ↑ Blackwill, Robert D; Allison, Graham (13 February 2013). "Opinion: Seek the wisdom of Lee Kuan Yew". Politico.com. Retrieved 2 September 2014. ↑ Barr, M. (2009). The ruling elite of Singapore: Networks of power and influence. ↑ 123,0 123,1 "Editor 'defamed' Singapore leader. BBC News. 24 September 2008. ↑ "Singapore backs Lee in media case". BBC News. 8 October 2009. ↑ "Singapore's Lee backtracks on Muslim comments’" Channel NewsAsia, 28 January 2011.